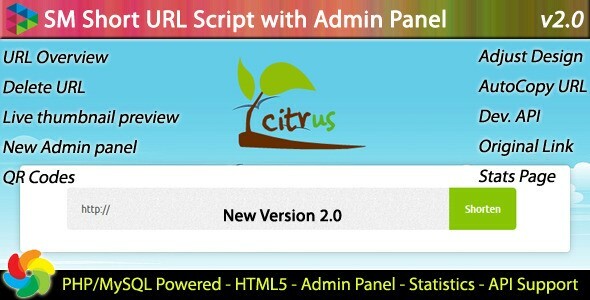 SM Short URL Script with Admin panel v2.5 - CODELISTPRO | Free Premium Scripts, Plugins, Apps Source Code. Featuring SM Short URL Script with a powerful admin panel. Its a template based php/mysql powered ready to go url shortener script with amazing features like jquery page transition effects, api support for developers, auto link copy with alert notification, social sharing features, error page for 404 or invalid links, google web fonts, 5 bundled themes, live thumbnail preview, stats, qr codes and admin panel to manage the shortened links.